Though Taylor Helmkamp (on left) and Stefanie Fink hold second place ribbons, Miami of Ohio head coach Jim Arrigon knows he has a tie for first in the team competition! In what was a close race throughout, Virginia Intermont and Miami of Ohio ended up in a tie for high point team at the IHSA tenth anniversary Holiday Tournament of Champions horse show. Both Miami of Ohio and Virginia Intermont ended up with 33 points in a field of 26 schools. Penn State, led by Lindsey Phoebus (who was the grand champion rider) placed third with 25 points while Findlay was fourth with 24. Miami of Ohio has proved to be the most consistant team through the second of three invitational tournaments thus far, having scored 33 points and reserve at the pre-season Tournament of Champions show in Storrs, CT on September 21st. 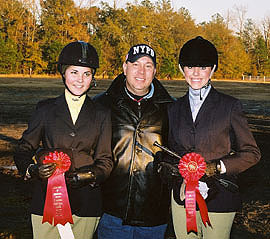 Megan Palmer (first in open flat and fourth in open fences) and Sarah Zichi (first in intermediate flat) won classes for the red hawks while Lisa Lewis (intermediate fences), Taylor Helmkamp (novice flat) and Stefanie Fink (walk-trot) all placed second in their visits to the brand new covered arena at St. Andrews'. Virginia Intermont benefited most from the blue ribbon, as Kim Hezzelwood (intermediate fences), Sonnie Ingalls (novice fences), Angee Quattro (open flat) and Jennifer Parshall (walk-trot) all won classes outright for Eddie Federwischs' team from Bristol, VA. Parshalls' victory was in the same class that Fink placed second. Though there were two classes to go at that point, neither Miami of Ohio nor Virginia Intermont had riders in either one of them, and both red hawk head coach Jim Arrigon and Federwisch knew they had tied for high point regardless of how the remaining classes unfolded. If there is a tie within the top six at an invitational show, the coaches involved in the tie have a choice to break the tie via a pre-determined tiebreaker class or let the outcome sit as is. Since this show marked the third time that Miami of Ohio and Virginia Intermont had tied at one of the tournaments, and because each had won a tiebreaker once before, both Arrigon and Federwisch opted to leave the outcome a tie. "We will have the trophy for six months and then they will have the trophy," said Arrigon, perhaps joking, though the trophy for the winning team was in Miami of Ohios' possession following the show. There was a tie for fifth place, however, with Mount Holyoke head coach C.J. Law opting for the tiebreaker with the University of Maryland. The division which was pre-selected before the show turned out to be intermediate flat. There are no ride-offs at invitationals, so the head-to-head results of the earlier class determine who gets the ribbon. It turned out that Kara Douglas of Maryland had placed second in the class while Leigh Quarles of Mount Holyoke was fourth (in the same section of intermediate flat, incidentally). The "Equiterps" as they are known in zone 4, region 1 thus were officially fifth place, though Mount Holyoke and Maryland both claimed 18 points (one wonders what would have happened if neither Douglas nor Quarles had placed in intermediate flat. Would the tiebreaker result in a tie??). Up until today, the IHSA had been a strange rollercoaster ride for Penn State's Lindsey Phoebus. A known commodity outside the IHSA when she came to State College, PA in Fall of 1999, Phoebus suprised some by not winning the Cacchione Cup out of zone 3, region 3 (Erin O'Neil of Wilson had the honor), though she did reach the 2000 IHSA Nationals in individual open flat, placing tenth. Phoebus was not a major factor in 2000-01 for the nittany lions, and did not ride at any of the shows in 2001-02. Without Phoebus, Penn State finally saw their streak of nine consecutive region championships snapped by Wilson. Then opening day 2002 came along, and with it came the return of Lindsey Phoebus. The senior from Lafayette, NJ won both open classes back on September 22nd. However since then the rollercoaster turned downward, with teammate Allison Handler moving ahead narrowly in the race to be high point rider in region 3. Today Phoebus silenced any critics once and for all, not only for winning the grand champion class at the end of the day, but more for her effort in winning the first class of the entire day. There were 13 riders in each of the undergraduate classes today, with Phoebus in the first section of open fences. Before the class was even pinned, Federwisch and St. Andrews' head coach Peggy McElveen were in agreement that "Section A" featured the finest riding either had seen in an IHSA class - EVER! Jon Conyers, the longtime head coach at Wesleyan College and now associated with the Findlay program claimed he would have scored eleven of the thirteen riders in the "80's" and "90's"! Conyers also judges IHSA shows and was amazed at the quality. One of those Conyers hopefully would have scored in the 90's was Phoebus, as judge Mike Rosser found her to be the blue ribbon winner. By winning the section, Phoebus qualified for the "Grand Champion Rider Challenge" class at the end of the day, where anyone who won a class, novice or higher, returned. Though some riders rode both flat and fences today, Phoebus would have the honor of being the only rider in the first class and the last class (Handler was Penn State's open flat rider), with firsts in both! Phoebus winning at the beginning of the day may have sparked the nittany lions, as Alyssa Srock (third in novice fences), Kara Spengler (second in novice flat) and Nicole Connolly (first in walk-trot) all helped lift Penn State to 25 points and third place. At the end of the day, Phoebus edged out Meredith Houx of Texas A & M for the title of Grand Champion (Houx, a junior from Albuquerque, NM, had won the section of open fences immediately following Phoebus). All of this was hopefully a nice coming-home present to nittany lion head coach Malinda Grice, who was a 1993 graduate of host St. Andrews. Two seasons ago the University of Findlay captured both high point english and western team championships at IHSA Nationals. Lori Cramers' oilers seem like a strong contender to make another go of it in Murfreesboro, at least based on their performance at St. Andrews (they will have to pull ahead of Otterbein in their region along the way). Findlay could claim the only other rider besides Phoebus to win two classes, though for some reason, she wore different numbers in each! Mara Keith Hunter wore number 750 while winning the novice over fences, but later wore number 826 in novice flat. What are the odds of two people named Mara Keith Hunter attending Findlay and ultimatly finding themselves on the equestrian team and both in the novice division? How about one to nothing! Hunter was not the only oiler to win a class. Some may recall Coagi Maten of Findlay winning the exact same team class at the 2001 and 2002 IHSA National shows. Maten has finally pointed out of novice flat, so she will not be riding in that division within a team competition again. Maten may wreck havoc on the intermediate flat from now on, as the senior won in that division at todays' show. Others to win classes today were Nicole Eula (intermediate fences) and Melissa Rabbitt (walk-trot-canter) of Mount Holyoke, Rebecca Vanderhoff of St. Andrews (novice flat) and Jennifer Palmadessa of the University of Connecticut (the other section of walk-trot-canter). Eula could claim to have won the exact same division at the pre-season tournament of champions (as could Palmer of Miami of Ohio and both Hezzelwood and Parshall of Virginia Intermont). Though she did not win a class today, University of Maryland sophomore Douglas was second in both intermediate trips and played as big a part as anyone in bringing the equiterps' up to fifth place overall. Held between the end of the fences classes and the start of the flat classes was the "Alumni Medal" class, with all nine entries first jumping, then flating, then being pinned. Recent Berry College graduate Mary Hughston had not ridden in any fall zone 5, region 2 shows (or in any other region for that matter), yet the rules allow her to compete alumni today. Refering to herself as a "First-timer" in alumni, Hughston was second overall. Andrea Bill of Mount Holyoke, who was second in both alumni classes at the 2002 IHSA Nationals, was third today. The fifth place winner had placed above Bill in both of those 2002 Nationals classes. Alison Karkut of St. Lawrence accompanied her old team to the invitational. Last season Karkut rode alumni in zone 3, region 1 (all of Long Island, NY and some of Connecticut) and ultimatly won both classes at Nationals. Karkuts' appearance today was her first at an IHSA show this season. Kit Adkins of Clemson was fourth between Bill and Karkut. Two University of Connecticut riders took part, with Sue Simon placing sixth and Amy Tuckerman out of the ribbons. Two other riders who did not place deserve a mention, as one of them was a coach today while the other was feared out of commission for months following a fall on November 10th. The former would by Trisha Prettyman, at one time a very successful open rider for the University of Maryland. It turns out that Emmie Prettyman, mother of Trisha and head coach of the University of Maryland team, decided that the weekend chores should be split up around their barn (Clay Hill Stables in Springdale, MD). One of the chores was to take the Maryland team to the invitational, which Emmie decided Trisha should do! The latter alumni rider is Maria Triolo, who spent the first year and a half of her school days at Penn State and the last two and a half at C.W. Post. Triolo fell and was rolled on during her jumping class at the Fairfield show on November 10th. It turned out she had not broken anything after all (Triolo had broken her ankle at an IHSA show 18 months earlier, and many who saw the fall feared she had broken something on the same leg once again). Though she did not pin, Triolo, who once had to go first out of 25 riders in a Cacchione Cup class at Nationals, looked just fine. Who won todays' alumni class? It was Jon Dreyer, the Miami of Ohio graduate who has already clinched a trip to regionals in both alumni divisions! Though there was plenty of team spirit, the noise level at todays' show was quieter than most regular season shows. One team that was not shy to show support was Rutgers University. The loudest noise of the day was when freshman Danielle Strangos placed third in the second section of open fences. Not only was there applause and "Yeas!" but at least one person let out a scream! "It was probably me," said Strangos herself later in the day. Her teammate Erica Bello earned a sixth in novice fences, and the same noise was heard at that time. Vanderbilt University was perhaps the only school in attendance that claims to be without a coach at the moment. "This is our coach, the Sony Handycam," said commodore open rider Mawghan McCabe. The team did crowd around the coach to review what may have gone right or wrong following each class. But can the handycam steward? When Miami of Ohio showed at the pre-season tournament of champions, the one thing that kept them from first place (Cazenovia beat both Miami of Ohio and Mount Holyoke by six points) was their lack of a walk-trot rider. Following the invitational, team captain Tess Downing and Arrigon (along with wife Gwen, son Matt and Matt's girlfriend Stefanie Fink) sat down to discuss how to fill the walk-trot divison. While everyone threw out ideas about what kind of rider they needed, Fink, who knew nothing about riding, asked some questions about the sport that proved she could follow the IHSA structure and that she had no riding experience whatsoever. Perhaps it was Downing who, upon hearing that Fink was a freshman at Miami of Ohio, said "C'mon. We're taking you out riding!" There were a pair of beat-up chaps lying around, with the word "Slick" on the back that served as Finks' riding apparel for the initial lessons. And thus was born the legend of "Slick" Stefanie Fink, second today in walk-trot at the tenth anniversary Holiday Tournament of Champions. Show Incidentals: High Temperature in the mid 40's. Sunny skies. Show held in covered arena. Start time: 9:52AM. Finish: 5:05PM. Judge: Mike Rosser, Southern Pines, North Carolina. Stewards: Federwisch/Virginia Intermont College, Shirley Murphy/Stonehill College and Pam Bruemmer/Texas A & M University. This show was Hunter Seat or English only. Team Totals: Virginia Intermont College (TIE-High Point Team) 33; Miami of Ohio (TIE-High Point Team) 33; Penn State University 25; University of Findlay 24; University of Maryland 18; Mount Holyoke College 18; University of Michigan 16; St. Andrews' Presbyterian College 15; St. Lawrence University 15; University of Connecticut 14; University of Delaware 14; University of Kentucky 13; Stonehill College 12; Texas A & M University 12; Berry College 11; Cazenovia College 10; Ohio University 10; University of the South 10; Virginia Tech 10; Purdue University 9; Fairfield University 6; Vanderbilt University 6; Clemson University 5; Rutgers University 5; Wake Forest University 4 and University of Wisconsin at Madison 4. Open equitation over fences - Section A: 1. Lindsey Phoebus, Penn State University. 2. Jessica West, Ohio University. 3. Kate Cronin, Fairfield University. 4. Missy Starr, Cazenovia College 5. Ashley Myers, University of Kentucky. 6. Erika Jewell, Virginia Intermont College. Open equitation over fences - Section B: 1. Meredith Houx, Texas A & M University. 2. Dyanna Rucco, Stonehill College. 3. Danielle Strangos, Rutgers University. 4. Megan Palmer, Miami University of Ohio. 5. Krista Steinmetz, Purdue University. 6. Mawghan McCabe, Vanderbilt University. Intermediate equitation over fences - Section A: 1. Nicole Eula, Mount Holyoke College. 2. Lisa Lewis, Miami University of Ohio. 3. Ingrid Bjornson, University of Kentucky. 4. Thomas Brennan, Stonehill College. 5. Kristen James, University of Wisconsin at Madision. 6. Racheal Sharrow, Wake Forest University. Intermediate equitation over fences - Section B: 1. Kim Hezzelwood, Virginia Intermont College. 2. Kara Douglas, University of Maryland. 3. Jill Callahan, St. Lawrence University. 4. Frank Bassett, Cazenovia College. 5. Mara Sullivan, Virginia Tech. 6. Diana Davis, Clemson University. Novice equitation over fences - Section A: 1. Sonnie Ingalls, Virginia Intermont College. 2. Ann Marie Reubin, Texas A & M University. 3. Alyssa Srock, Penn State University. 4. Alicia Salo, Virginia Tech. 5. Hally Yandon, University of the South. 6. Erica Bello, Rutgers University. Novice equitation over fences - Section B: 1. Mara Keith Hunter, University of Findlay. 2. Katie Leaman, University of Michigan. 3. Megan Bowers, University of Connecticut. 4. Lauren Cannon, Berry College. 5. Kristin Ricciardone, University of Delaware. 6. Kelly Long, Miami University of Ohio. Alumni hunter seat equitation (flat and fences phases combined): 1. Jon Dreyer, Miami University of Ohio. 2. Mary Hughston, Berry College. 3. Andrea Bill, Mount Holyoke College. 4. Kit Adkins, Clemson University. 5. Alison Karkut, St. Lawrence University. 6. Sue Simon, University of Connecticut. Novice equitation on the flat - Section A: 1. Rebecca Vanderhoff, St. Andrews' Presbyterian College. 2. Kara Spengler, Penn State University. 3. Danielle Graf, Virginia Intermont College. 4. Alannah DiBona, Wake Forest University. 5. Cary Hillier, Berry College. 6. Alison Montoya, University of Kentucky. Open equitation on the flat - Section A: 1. Megan Palmer, Miami of Ohio (Black). 2. Kelly Ross, University of Delaware. 3. Nikki Jeffries, University of Michigan. 4. Christina Walsh, Purdue University. 5. Ashley Myers, University of Kentucky. 6. Missy Starr, Cazenovia College. Walk-trot equitation on the flat - Section A: 1. Nicole Connolly, Penn State University. 2. Lauren Stille, University of Delaware. 3. Jenny Sinclair, University of the South. 4. Angie Meinhardt, University of Findlay. 5. Lindsey Godby, University of Kentucky. 6. Laura Readick, Purdue University. Intermediate equitation on the flat - Section A: 1. Sarah Zichi, Miami University of Ohio. 2. Alicia Salo, Virginia Tech. 3. Elizabeth Dotts, University of the South. 4. Lesley Maradik, Purdue University. 5. Erin Jackson, Penn State University. 6. Jill Marinis, Ohio University. Walk-trot-canter equitation on the flat - Section A: 1. Jennifer Palmadessa, University of Connecticut. 2. Kelly Eatman, Berry College. 3. Katie DeLucas, St. Andrews' Presbyterian College. 4. Kate Bennett, Cazenovia College. 5. Allison Nolting, University of Kentucky. 6. Mary Page Black, Clemson University. Open equitation on the flat - Section B: 1. Angee Quattro, Virginia Intermont College. 2. Erika Baker, University of Maryland. 3. Mawghan McCabe, Vanderbilt University. 4. Howard Morrison, St. Andrews' Presbyterian College. 5. Whitney Slausen, St. Lawrence University. 6. Jessica Wilson, Berry College. Novice Equitation on the flat - Section B: 1. Mara Keith Hunter, University of Findlay. 2. Taylor Helmkamp, Miami University of Ohio. 3. Lynn Hatfield, University of Michigan. 4. Alex Toregas, University of Maryland. 5. Ashley Kinsey, Clemson University. 6. Julie MacKay, Mount Holyoke College. Walk-trot equitation on the flat - Section B: 1. Jennifer Parshall, Virginia Intermont College. 2. Stefanie Fink, Miami University of Ohio. 3. Gina Marie Romanello, Stonehill College. 4. Jill Connors, University of Connecticut. 5. Michelle Venema, University of Wisconsin at Madision. 6. Heather Grindell, St. Andrews' Presbyterian College. Intermediate equitation on the flat - Section B: 1. Coagi Maten, University of Findlay. 2. Kara Douglas, University of Maryland. 3. Tarah Watson, St. Lawrence University. 4. Leigh Quarles, Mount Holyoke College. 5. Sue Ploski, Fairfield University. 6. Diana Davis, Clemson University. Walk-trot-canter equitation on the flat - Section B: 1. Melissa Rabbitt, Mount Holyoke College. 2. Hallie Britt, St. Lawrence University. 3. Lisa Soukup, Ohio University. 4. Catie Case, University of Michigan. 5. Leslie Dolivo, University of Delaware. 6. Camie Griffith, Vanderbilt University. Grand Champion Rider Challenge Class: 1. Lindsey Phoebus, Penn State University. 2. Meredith Houx, Texas A & M University.